The decorated smock was an integral part of the complex layers of clothing worn by women from wealthy families. It was an undergarment in the sense that it was worn under the outermost items of dress, but it was never intended to be concealed completely as underwear is generally today. 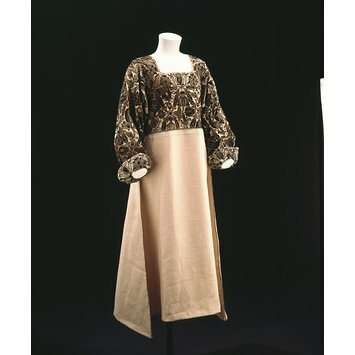 Decorated smocks could also be worn as semi-formal wear in bed for receiving visitors. The smock was probably made in the household of the girl or woman for whom it was intended. Most young girls in well-to-do households learned how to embroider, so this embroidery could well have been worked by a skilled amateur. It seems likely that the black silk on this smock was of Spanish origin because it has lasted very well. Black English silk of the period contained more iron, which caused the silk fibres to rot. The smock was made of two different grades of linen. 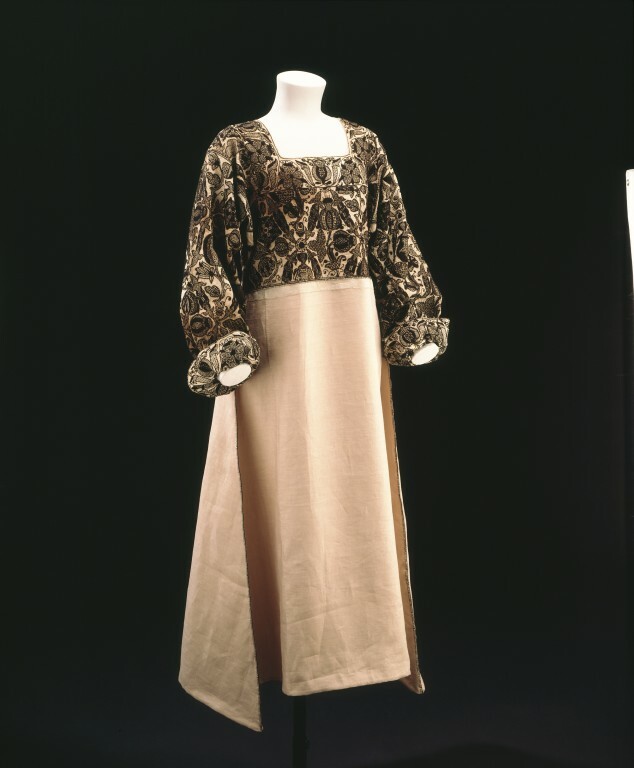 A fine weave linen was used for the bodice and sleeves and, as two small surviving strips indicate, a coarser one was employed for the skirt. Contemporary documents indicate that this was quite normal, the finer and more expensive linen being used only for areas of the smock that might be seen. The predominance of floral motifs in the design reflects the growing fascination with flowers in England during the 16th century and the development of domestic gardens. Women's smock top consisting of a partlet, pair of sleeves, and two rosettes embroidered in black silk on linen, and two strips of linen stitched with black silk. Embroidered in back, stem and darning stitches with buttonhole filling.